They were hills, once. Fifteen thousand years ago the islands of San Francisco Bay were tall pyramids cloaked in green forests of cedar and pine. These hills jutted up from a broad, rumpled plain, where Pleistocene bison and horses wandered, as well as camels and saber tooth tigers. Valleys between the hills were threaded by glittering creeks and one mighty river. These streams wound through a huge, wooded basin, then out through the Golden Gate, pouring themselves toward the Pacific Ocean. At that point, much of North America was locked under glacial sheets of the last Ice Age. These sprawling glaciers, plus the swollen polar ice caps, slurped up so much of the Earth’s water that ocean levels were 300-400 feet lower than they are today. After shooting the narrows of the Golden Gate, those rivers had to wind westward another 32 miles before they reached the sea. But then they scored a reward. The waters leapt off a grand cliff that lay six miles beyond Los Farallones. That soaring precipice was formed by the edge of the continental shelf. This primeval cataract must have presented a scene of natural splendor to rival the much-lauded Yosemite waterfalls. Today, the Farallons can be seen lying 26 miles west of San Francisco, separated from the mainland by a broad band of open sea. On clear, fogless days, they appear like a mirage on the horizon. Their highly intermittent guest appearance may be why local Miwok tribes considered this cluster of spectral summits their land of the dead. Because of Earth’s current global warming trend, our most recent Ice Age remains in headlong retreat. The Earth’s glaciers and ice floes continue to release waters, feeding our rising seas. Because of that, some of the lower-lying islands in our present-day San Francisco Bay may go underwater in a century or two. 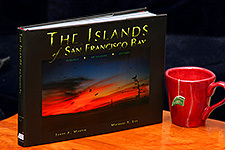 Station Island, Bair Island and The Sister Islands may join the Bay’s Blossom, Arch, Shag and Harding rocks. They’ll win a dark new status as they sink away from sunlight. They’ll no longer be islands, but barely awash menaces to navigation, to be marked by buoys and/or whittled by use of explosives. Highly developed and populous Alameda Island, if it is to survive, will likely need to transform itself into our local Netherlands, diking itself off from the remorseless advance of ever-higher tides. ..... purchase your signed copy today to finish the introduction. It, and the thirteen chapters with their richly storied captions, are sure to teach volumes about this great Bay.